As I type this out, I am sitting at SFO about to head back to Denver. I have been in San Francisco for six days (roughly), and, the original intent of the trip was to attend VentureScape 2013 Office Hours yesterday and spend the rest of the time meeting with friends, colleagues, etc. The plans have changed since early last month though: my parents take an annual trip to California and when they heard I would be back in SF during this time period, they decided they would also travel out at the same time. Plus, this year was one of those special years where Mother’s Day fell on the same day as my brother’s birthday. So, the trip became a family-oriented one rather than friends-social-business-oriented. I am perfectly fine with the way things turned out, but am also disappointed I was not able to meet with folks I had said I would meet with when I was next out here. Well, the timing was not right for that; and, as one Twitter follower said to me, “Family is priority.” It’s true; my parents aren’t getting any younger these days (and neither are we). Over the weekend, we went to a winery in Livermore and did a small tasting; went to Hakone Gardens to look at the bamboo garden; ate good seafood and good steak; and generally enjoyed the drive around Silicon Valley. It was a good time with my family; couldn’t trade it for anything else. I was able to meet with a few friends, but only a few. A few had to cancel but I found that to be no big deal considering I was pretty much a flyby visitor. It was a good trip, and probably my last trip to the Bay Area for the year…unless something else harkens me to the area. Although I am disappointed that I was not able to see a lot of friends, I am also okay with that. Life happens, and just have to go along with the flow. Mustache pic with Liz H. at the Try it Local booth. Whew. 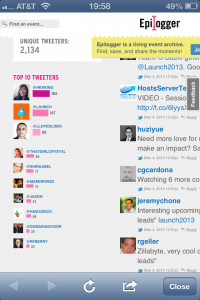 It’s already a week after the Launch Festival in San Francisco. I’m sitting here, sipping on green juice and wondering how the week just flew by. When I first decided to go to Launch, my intent was to go spread the word about TAOpivot to others in the Bay Area; you know, do some networking like I usually do. 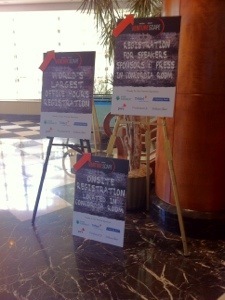 What I didn’t expect was for the conference to be MORE than just that! I was so excited to go to Launch that I started following the #Launch2013 topic and pinging people to see if we could meet up. Once I got to the event, I was doing part live-tweeting of main stage sessions and also continuing to message other attendees to try to meet up. 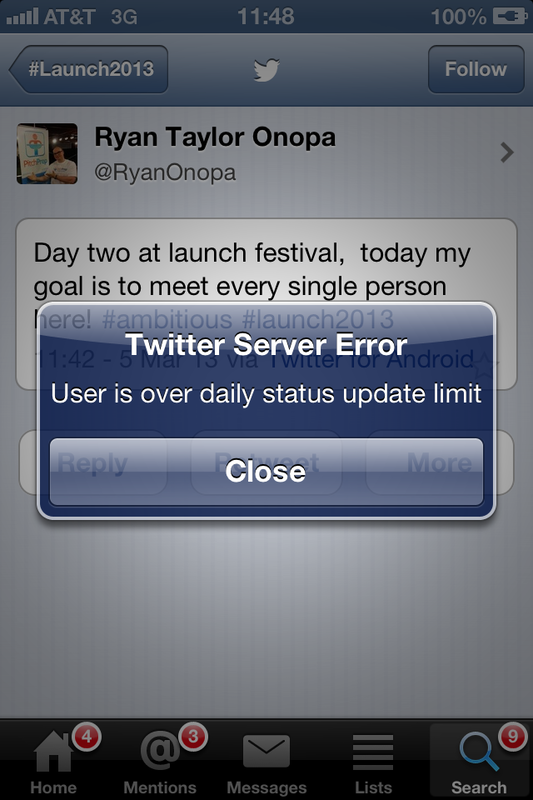 Yup, I out-tweeted the @Launch account. Stats from Epilogger. 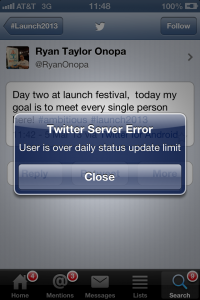 So, after the first day, I unintentionally out-tweeted the official @Launch account. I was stunned and … well, didn’t expect for so much to happen out of that. Ok, the actual Launch festival: Jason really hit it out of the ballpark. Fireside Chat with Chamath was so awesome (and so many quotable things….”Jason is a fungus”). Inspiring Accelerator and Angel Investor panels. Fun demos from companies launching at the festival! There were plenty of startups to visit in the Demo Pit that I couldn’t hit up all the booths. I felt the buzz of hope, change, life! in the air. 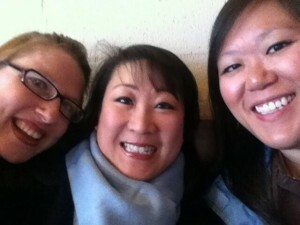 It was nice to meet other likeminded people and chat about our similar yet different struggles in our startup lives. 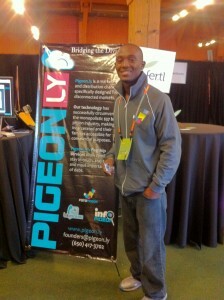 Pigeon.ly’s mission is so unique: helping divided communities come together! What could have been improved? The timing. Every day we started later than expected; I missed a lot of the Skills Stage and Office Hours sessions because the Main Stage ran behind. Poo. The Diversity in Tech panel could have been more than just a whine-fest–it only touched the service of the topic. I know many other female founders felt that there could have been more female representation via launch demos, panels, and judges. I’d like to see a bit of balance there, too. 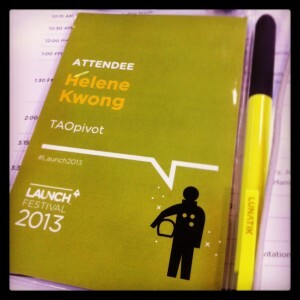 Overall, I really enjoyed myself at Launch. I loved meeting people from all over the world and just .. knowing we’re all in this together. Three days is all it takes to make some lasting, meaningful connections. Three days can change your life, as it did for me! 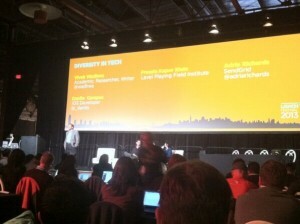 Vivek Wadwha with the Diversity in Tech Panel at Launch 2013. Show up 10 minutes before Registration officially begins – I still had to wait in the “cold” weather, but I was able to get in to have enough time to eat some pastries, drink coffee, and chat with a few founders. Do not walk up to fellow Coloradans after seeing tweet – Somebody from Fort Collins, CO was standing in line behind me and tweeted a pic of the line, essentially including my presence (my back) in the photo. I walked up to this person after I got my badge and introduced myself. Said person gave me a look for saying “I found you on Twitter.” -shakin’ my head- I didn’t reconnect with the person afterwards because he seemed uncomfortable that I was so forward with my intro. Ethernet cords are still very useful – Many attendees were complaining about the wifi, but the Launch team prepped for the outcry with tons of ethernet cords supplied. So, if I had brought my MBP, I would have been able to be on computer, tweet, and do work. Learn to navigate mazes to get food – A fellow founder and I had trouble locating the Google Entrepreneurs breakfast goodies .. we thought it was a bad joke that the only ‘breakfast’ we’d get was coffee. But then…we found the magical food section, hidden behind black curtains. 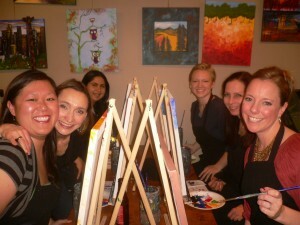 After that, we became the food-direction masters, directing others towards the hidden treasure. Make a tentative list of startups to visit in Demo Pit – The Demo Pit has so many companies! When I walked straight into the pit I got a huge sense of overwhelm. I should have made a list so I could hit up my favorite startups first! Well, I luckily have two more days. Do not trust “booth babes” – I didn’t know what people were talking about…but now I know. There was a booth with women dressed in military fatigue, tall pumps, and provocative stockings. They looked like Barbie Dolls. 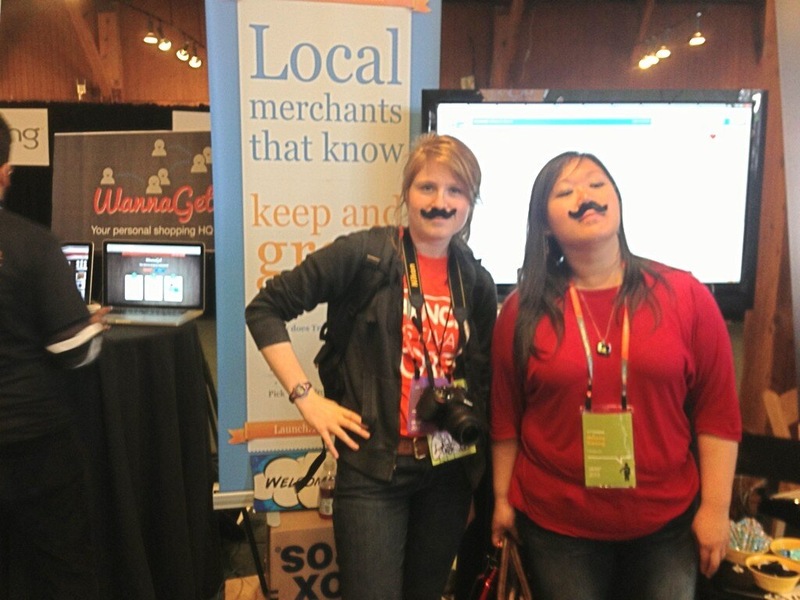 And the whole booth was just offensive….anyway, @Jason got rid of the group so we won’t be seeing them tomorrow. The conference runs for the next two days, so I’m sure my Wednesday update may have more lessons (or just plain amusing moments). Call The City [San Francisco] “Frisco” or “San Fran” – Oh. My. Goodness. This drives me CRAZY every time! San Franciscans are very very sensitive to the way the City is referred as….”Frisco” and “San Fran” are NOT proper. Say this in front of a SF resident, get something tossed at you. Even I, who no longer resides in SF, get super-peeved when I hear people referring to SF that way. Always stay safe and say “SF” or “The City” or just plain “San Francisco”. You’ll get more points in fitting in that way. Make the mistake of walking hills for two blocks – Yes, I did this when I first moved there. I remember looking at a map while apartment hunting; saw that, once I got off the bus, I only needed to walk a few blocks this way and that way. 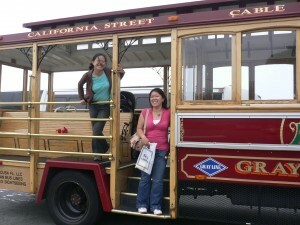 Little did I know….this involved the hilly streets in Nob Hill. Oops. I was panting by the end of my trek and I didn’t even get the apartment there. Note: I was panting after my walk because this was way before I got acclimated to Denver’s higher altitude. Think MUNI & BART mean the same thing and go the same places – Another one of my mistakes. Actually, before I even moved out to San Francisco, I thought BART was the only transit system in the city. I remember asking people on a Livejournal community (Oh….so long ago) about good places near BART stations in SF. I got a lot of confused responses from people. I arrived and realized oops….BART = Bay Area Rapid Transit. I should have been asking about MUNI instead (also, there’s the Golden Gate Transit and several other Bay Area transit systems running amuck within the city). Take a MUNI train the wrong direction and end up in a bad neighborhood – Ok, this didn’t happen to me, but I’ve heard this happening before: PAY ATTENTION TO WHICH DIRECTION YOUR TRAIN IS GOING. Usually, the “Outbound” trains are going towards Sunset/Ocean Beach. “Inbound” is going downtown. The only line that’s a little different is the T line….and please, you don’t want to make the mistake of taking the T Line the wrong direction. You might end up in a really bad neighborhood. Prior to arrival, make a comment about how San Francisco is “sunny and warm” – Such an assumption about San Francisco and California in general: San Francisco is foggy and “cool” for the most part. Temperatures range from 50 – 70 degrees year-round. Denverites, you’ve already heard me comment on how the weather is there: 50 degrees in SF is when people wear their huge winter jackets. In Denver, we wear shorts at that temperature. 😉 Anyway, don’t be fooled to think all of San Francisco is ALWAYS sunny like Downtown/Chinatown/Fisherman’s Wharf. 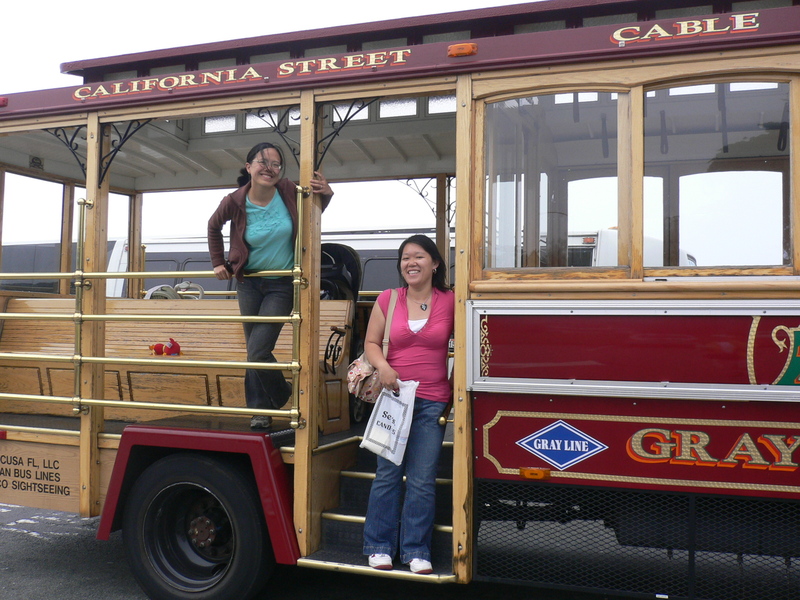 The city has many micro-climates, so you may be riding a MUNI train from downtown to Ocean Beach and come across patches of foggy neighborhoods, sunny neighborhoods, and even cloudy neighborhoods. Always be prepared for the micro-climates! Not realizing the high cost of living before you move here – Oh yes; one of my biggest mistakes, but then again, I had just graduated from college and had no idea of how different the cost of living was throughout the country. I landed in SF, went apartment-hunting, and found my first studio by Pier 39. Monthly rent? $1,450 … and I thought that was cheap. Oh…naïveté. Do your research beforehand! Ask any locals about certain neighborhoods if you can; generally, I’ve found living by the ocean (the Sunset or the Richmond districts) is relatively more affordable than living in SoMa or anywhere downtown. To find much more affordable places, you will have to look outside of The City, but then you’ll need to factor in commute time if you work in SF. 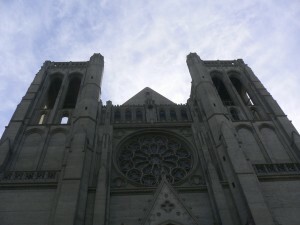 Think Bay Area = San Francisco – Ok, so San Franciscans like to think they are the only ones that exist in the Bay Area. But, don’t fall for that trap: the San Francisco Bay Area consists of many more cities and land than you may think. The North Bay is connected to SF via the Golden Gate Bridge; the towns up this way range from rustic to slightly ritzy, depending on how north you go. The East Bay is connected to SF via the Bay Bridge; go here for Oakland, Berkeley, etc. Walnut Creek is a nice little town out east. Then, there’s the Peninsula, Silicon Valley, and the South Bay: generally, South Bay refers to San Jose area. Silicon Valley and the Peninsula are all the towns in between SF and San Jose. And there you have it: a not-so-definitive guide about San Francisco and how to draw less attention to you, the tourist or the newbie in the city. Take heed of these guidelines, and soon you’ll be able to fit right into the crowds in SF.